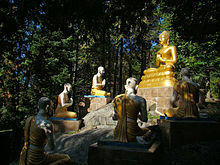 Buddhism in Vietnam (Đạo Phật or Phật Giáo in Vietnamese), as practised by the ethnic Vietnamese, is mainly of the Mahayana tradition. Buddhism may have first come to Vietnam as early as the 3rd or 2nd century BCE from the Indian subcontinent or from China in the 1st or 2nd century CE. Vietnamese Buddhism has had a syncretic relationship with certain elements of Taoism, Chinese spirituality and the Vietnamese folk religion. The One Pillar Pagoda is a historic Mahayana Buddhist temple in Hanoi, the capital of Vietnam. Bái Đính Temple is a complex of Mahayana Buddhist temples on Bai Dinh Mountain. Statue of Avalokiteśvara, lacquered and gilded wood at the Bút Tháp Temple, dating from the Restored Lê era with inscription "autumn of the year Bính Thân" (1656). Hải Đức Buddha, the 30 ft tall statue built in 1964 at Long Sơn Pagoda in Nha Trang. 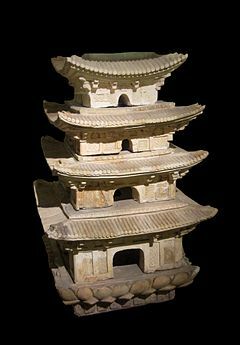 Ceramic pagoda with lotus, bodhi leaf, dancer decoration, Hanoi (Lý dynasty, 11th-13th century). Terracotta Bodhi leaves with dragon motif (Lý-Trần dynasties, 11th-14th century). There are conflicting theories regarding whether Buddhism first reached Vietnam during the 3rd or 2nd century BCE via delegations from India, or during the 1st or 2nd century from China. 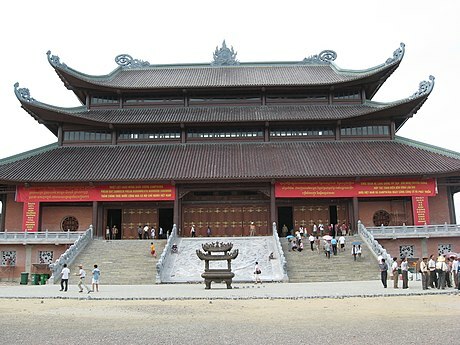 In either case, by the end of the second century CE, Vietnam had developed into a major regional Mahayana Buddhist center centering on Luy Lâu in modern Bắc Ninh Province, northeast of the present day capital city of Hanoi. Luy Lâu was the capital of the Han region of Jiaozhi and was a popular place visited by many Indian Buddhist missionary monks en route to China. The monks followed the maritime trade route from the Indian sub-continent to China used by Indian traders. A number of Mahayana sutras and the āgamas were translated into Classical Chinese there, including the Sutra of Forty-two Chapters and the Anapanasati. Jiaozhi was the birthplace of Buddhist missionary Kang Senghui who was of Sogdian origin. Over the next eighteen centuries, Vietnam and China shared many common features of cultural, philosophical and religious heritage. This was due to geographical proximity to one another and Vietnam being annexed twice by China. Vietnamese Buddhism is thus related to Chinese Buddhism in general, and to some extent reflects the formation of Chinese Buddhism after the Song dynasty. Theravada Buddhism, on the other hand, would become incorporated through the southern annexation of Khmer people and territories. During the Đinh dynasty (968-980), Buddhism was recognized by the state as an official faith (~971), reflecting the high esteem of Buddhist faith held by the Vietnamese monarchs. The Early Lê dynasty (980-1009) also afforded the same recognition to the Buddhist church. The growth of Buddhism during this time is attributed to the recruitment of erudite monks to the court as the newly independent state needed an ideological basis on which to build a country. Subsequently, this role was ceded to Confucianism. Vietnamese Buddhism reached its zenith during the Lý dynasty (1009–1225) beginning with the founder Lý Thái Tổ, who was raised in a pagoda. All of the kings during the Lý dynasty professed and sanctioned Buddhism as the state religion. This endured with the Trần dynasty (1225–1400) but Buddhism had to share the stage with the emerging growth of Confucianism. By the 15th century, Buddhism fell out of favor with the court during the Later Lê dynasty, although still popular with the masses. Officials like Lê Quát attacked it as heretical and wasteful. It was not until the 19th century that Buddhism regained some stature under the Nguyễn dynasty who accorded royal support. A Buddhist revival movement (Chấn hưng Phật giáo) emerged in the 1920s in an effort to reform and strengthen institutional Buddhism, which had lost grounds to the spread of Christianity and the growth of other faiths under French rule. The movement continued into the 1950s. From 1954 to 1975, Vietnam was split into North and South Vietnam. In a country where surveys of the religious composition estimated the Buddhist majority to be approximately 50 to 70 percent, President Ngô Đình Diệm's policies generated claims of religious bias. As a member of the Catholic Vietnamese minority, he pursued pro-Catholic policies that antagonized many Buddhists. In May 1963, in the central city of Huế, where Diệm's elder brother Ngô Đình Thục was the archbishop, Buddhists were prohibited from displaying Buddhist flags during Vesak celebrations yet few days earlier, Catholics were allowed to fly religious flags at a celebration in honour of the newly seated archbishop. This led to widespread protest against the government; troops were sent in and nine civilians were killed in the confrontations. This led to mass rallies against Diệm's government, termed as the Buddhist crisis. The conflicts culminated in Thích Quảng Đức's self-immolation. President Diệm's younger brother Ngô Đình Nhu favored strong-armed tactics and Army of the Republic of Vietnam Special Forces engaged in the Xá Lợi Pagoda raids, killing estimated hundreds. Dismayed by the public outrage, the US government withdrew support for the regime. President Diệm was deposed and killed in the 1963 coup. Political strength of the Buddhists grew in the 1960s as the different schools and orders convene to form the Unified Buddhist Church of Vietnam. Leaders of the Church like Thích Trí Quang had considerable sway in national politics, at times challenging the government. With the fall of Saigon in 1975, the whole nation came under Communist rule; many religious practices including Buddhism were discouraged.In the North the government had created the United Buddhist Sangha of Vietnam, co-opting the clergy to function under government auspices but in the South, the Unified Buddhist Sangha of Vietnam still held sway and openly challenged the communist government. The Sangha leadership was thus arrested and imprisoned; Sangha properties were seized and the Sangha itself was outlawed. In its place was the newly created Buddhist Sangha of Vietnam, designed as the final union of all Buddhist organizations, now under full state control. Since Đổi Mới (1986) many reforms have allowed Buddhism to be practiced relatively unhindered by the individuals. However no organized sangha is allowed to function independent of the state. It was not until 2007 that Pure Land Buddhism, the most widespread type of Buddhism practiced in Vietnam, was officially recognized as a religion by the government. Thích Quảng Độ the Patriarch of the Unified Buddhist Sangha, once imprisoned, remains under surveillance and restricted in his travels. Today, Buddhists are found throughout in Vietnam, from North to South. Buddhism is the single largest organized religion in Vietnam, with somewhere between 40% and 85% of the population identifying themselves as Buddhist. After the fall of South Vietnam to communism in 1975 at the end of the Vietnam War, the first major Buddhist community appeared in North America. Since this time, the North American Vietnamese Buddhist community has grown to some 160 temples and centers. Proselytizing is not a priority. The most famous practitioner of synchronized Vietnamese Thiền in the West is Thích Nhất Hạnh who has authored dozens of books and founded the Plum Village Monastery in France together with his colleague, bhikṣuṇī and Zen Master Chân Không. According to Nguyen and Barber, Thích Nhất Hạnh's fame in the Western world as a proponent of engaged Buddhism and a new Thiền style has "no affinity with or any foundation in traditional Vietnamese Buddhist practices"  and according to Alexander Soucy (2007) his style of Zen Buddhism is not reflective of actual Vietnamese Buddhism. Thích Nhất Hạnh often recounts about his early Thiền practices in Vietnam in his Dharma talks saying that he continued and developed this practice in the West which has a distinctive Vietnamese Thiền flavor. Thích Nhất Hạnh's Buddhist teachings have started to return to a Vietnam where the Buddhist landscape is now being shaped by the combined Vietnamese and Westernized Buddhism that is focused more on the meditative practices. Vietnamese art of the pure land of Kṣitigarbha. Followers in Vietnam practice differing traditions without any problem or sense of contradiction. Few Vietnamese Buddhists would identify themselves as a particular kind of Buddhism, as a Christian might identify him or herself by a denomination, for example. Although Vietnamese Buddhism does not have a strong centralized structure, the practice is similar throughout the country at almost any temple. Gaining merit is the most common and essential practice in Vietnamese Buddhism with a belief that liberation takes place with the help of Buddhas and bodhisattvas. Buddhist monks commonly chant sutras, recite Buddhas’ names (particularly Amitābha), doing repentance and praying for rebirth in the Pure Land. The Lotus Sutra and the Amitabha Sutra are the most commonly used sutras. Most sutras and texts are in Classical Chinese and are merely recited with Sino-Xenic pronunciations, making them incomprehensible to most practitioners. Three services are practiced regularly at dawn, noon, and dusk. They include sutra reading with niệm Phật and dhāraṇī recitation and kinh hành (walking meditation). Laypeople at times join the services at the temple and some devout Buddhist practice the services at home. Special services such as Sam Nguyen/Sam Hoi (confession/repentance) takes place on the full moon and new moon each month. Niệm Phật practice is one way of repenting and purifying bad karma. Buddhist temples also serve a significant role in death rituals and funerals among overseas Vietnamese. We will not consider here the misconceptions presented in most English-language materials regarding the distinctness of these schools, and the strong inclination for "syncretism" found in Chinese and Vietnamese Buddhism. Much has been said about the incompatibility of different schools and their difficulty in successfully communicating with each other and combining their doctrines. None of these theories reflects realities in Vietnam (or China) past or present. The followers have no problem practicing the various teachings at the same time. The methods of Pure Land Buddhism are perhaps the most widespread within Vietnam. It is common for practitioners to recite sutras, chants and dhāraṇīs looking to gain protection through bodhisattvas or dharmapalas. It is a devotional practice where those practicing put their faith in Amitābha (Vietnamese: A-di-đà). Followers believe they will gain rebirth in his pure land by chanting Amitabha's name. A pure land is a Buddha-realm where one can more easily attain enlightenment since suffering does not exist there. Many religious organizations have not been recognized by the government; however, in 2007, with 1.5 million followers, the Vietnamese Pure Land Buddhism Association (Tịnh Độ Cư Sĩ Phật Hội Việt Nam) received official recognition as an independent and legal religious organization. Thiền is the Sino-Xenic pronunciation of Chan (Japanese Zen) and is derived ultimately from Sanskrit "dhyāna". The traditional account is that in 580, an Indian monk named Vinitaruci (Vietnamese: Tì-ni-đa-lưu-chi) traveled to Vietnam after completing his studies with Sengcan, the third patriarch of Chan Buddhism. This would be the first appearance of Thiền. The sect that Vinitaruci and his lone Vietnamese disciple founded would become known as the oldest branch of Thiền. After a period of obscurity, the Vinitaruci School became one of the most influential Buddhist groups in Vietnam by the 10th century, particularly under the patriarch Vạn-Hạnh (died 1018). Other early Vietnamese Zen schools included the Vô Ngôn Thông, which was associated with the teaching of Mazu Daoyi, and the Thảo Đường, which incorporated nianfo chanting techniques; both were founded by Chinese monks. A new Thiền school was founded by King Trần Nhân Tông (1258–1308); called the Trúc Lâm "Bamboo Grove" school, it evinced a deep influence from Confucian and Taoist philosophy. Nevertheless, Trúc Lâm's prestige waned over the following centuries as Confucianism became dominant in the royal court. In the 17th century, a group of Chinese monks led by Nguyên Thiều introduced the Ling school (Lâm Tế). A more native offshoot of Lâm Tế, the Liễu Quán school, was founded in the 18th century and has since been the predominant branch of Vietnamese Zen. This is the main altar of a Vietnamese Buddhist temple near Seattle. In the front is a statue of Shakyamuni Buddha, the historical founder, while in the back is the "trinity" of Amitabha Buddha. On one side of Amitabha is Avalokitesvara Bodhisattva while on the other is Mahasthamaprapta Bodhisattva. Some scholars argue that the importance and prevalence of Thiền in Vietnam has been greatly overstated and that it has played more of an elite rhetorical role than a role of practice. The Thiền uyển tập anh (Chinese: 禪苑集英, "Collection of Outstanding Figures of the Zen Garden") has been the dominant text used to legitimize Thiền lineages and history within Vietnam. However, Cuong Tu Nguyen's Zen in Medieval Vietnam: A Study and Translation of the Thien Tap Anh (1997) gives a critical review of how the text has been used to create a history of Zen Buddhism that is "fraught with discontinuity". Modern Buddhist practices are not reflective of a Thiền past; in Vietnam, common practices are more focused on ritual and devotion than the Thiền focus on meditation. Nonetheless, Vietnam is seeing a steady growth in Zen today. Two figures who have been responsible for this increased interest in Thiền are Thích Nhất Hạnh, and Thích Thanh Từ, who lives in Da Lat. The central and southern part of present-day Vietnam were originally inhabited by the Chams and the Khmer people, respectively, who followed both a syncretic Śaiva-Mahayana (see History of Buddhism in Cambodia) and Theravada Buddhism. Đại Việt annexed the land occupied by the Cham during conquests in the 15th century and by the 18th century had also annexed the southern portion of the Khmer Empire, resulting in the current borders of Vietnam. From that time onward, the dominant Đại Việt (Vietnamese) followed the Mahayana tradition while the Khmer continued to practice Theravada. In the 1920s and 1930s, there were a number of movements in Vietnam for the revival and modernization of Buddhist activities. Together with the re-organization of Mahayana establishments, there developed a growing interest in Theravadin meditation as well as the Pāli Canon. These were then available in French. Among the pioneers who brought Theravada Buddhism to the ethnic Đại Việt was a young veterinary doctor named Lê Văn Giảng. He was born in the South, received higher education in Hanoi, and after graduation, was sent to Phnom Penh, Cambodia, to work for the French government. During that time he became especially interested in Theravada Buddhist practice. Subsequently, he decided to ordain and took the Dhamma name of Hộ-Tông (Vansarakkhita). In 1940, upon an invitation from a group of lay Buddhists led by Nguyễn Văn Hiểu, he went back to Vietnam in order to help establish the first Theravada temple for Vietnamese Buddhists at Gò Dưa, Thủ Đức (now a district of Hồ Chí Minh City). The temple was named Bửu Quang (Ratana Ramsyarama). The temple was destroyed by French troops in 1947, and was later rebuilt in 1951. At Bửu Quang temple, together with a group of Vietnamese bhikkhus who had received training in Cambodia such as Thiện Luật, Bửu Chơn, Kim Quang and Giới Nghiêm, Hộ Tông began teaching Buddhism in their native Vietnamese. He also translated many Buddhist materials from the Pali Canon, and Theravada became part of Vietnamese Buddhist activity in the country. In 1949–1950, Hộ Tông together with Nguyễn Văn Hiểu and supporters built a new temple in Saigon (now Hồ Chí Minh City), named Kỳ Viên Tự (Jetavana Vihara). 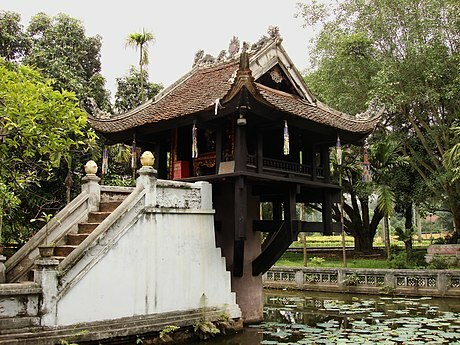 This temple became the centre of Theravada activities in Vietnam, which continued to attract increasing interest among the Vietnamese Buddhists. In 1957, the Vietnamese Theravada Buddhist Sangha Congregation (Giáo Hội Tăng Già Nguyên Thủy Việt Nam) was formally established and recognised by the government, and the Theravada Sangha elected Venerable Hộ Tông as its first President, or Sangharaja. From Saigon, the Theravada movement spread to other provinces, and soon, a number of Theravada temples for ethnic Viet Buddhists were established in many areas in the South and Central parts of Vietnam. There are 529 Theravada temples throughout the country, of which 19 were located in Hồ Chí Minh City and its vicinity. Besides Bửu Quang and Kỳ Viên temples, other well known temples are Bửu Long, Giác Quang, Tam Bảo (Đà Nẵng), Thiền Lâm and Huyền Không (Huế), and the large Thích Ca Phật Đài in Vũng Tàu. ^ Cuong Tu Nguyen & A.W. Barber. "Vietnamese Buddhism in North America: Tradition and Acculturation". in Charles S. Prebish and Kenneth K. Tanaka (eds). The Faces of Buddhism in America. Berkeley: University of California Press, 1998, pg 130. ^ Cuong Tu Nguyen. Zen in Medieval Vietnam: A Study of the Thiền Uyển Tập Anh. Honolulu: University of Hawaii Press, 1997, pg 9. ^ Cuong Tu Nguyen & A.W. Barber 1998, pg 132. ^ Nguyen Tai Thu. The History of Buddhism in Vietnam. 2008. ^ Tai Thu Nguyen (2008). The History of Buddhism in Vietnam. CRVP. pp. 36–. ISBN 978-1-56518-098-7. ^ Nguyen Tai Thu 2008, pg 77. ^ Nguyen Tai Thu 2008, pg 75. ^ Nguyen Tai Tu Nguyen 2008, pg 89. ^ Việt Nam: Borderless Histories – Page 67 Nhung Tuyet Tran, Anthony Reid – 2006 "In this first formal attack in 1370, a Confucian official named Lê Quát attempted, without much success, to brand Buddhism as heretical and to promote Confucianism. Times had drastically changed by Ngô Sĩ Liên's Lê dynasty." ^ The Vietnam Review: Volume 3 1997 "Buddhism The close association between kingship and Buddhism established by the Ly founder prevailed until the end of the Trân. That Buddhism was the people's predominant faith is seen in this complaint by the Confucian scholar Lê Quát ." ^ Elise Anne DeVido. "Buddhism for This World: The Buddhist Revival in Vietnam, 1920 to 1951, and Its Legacy." in Philip Taylor (ed), Modernity and Re-enchantment: Religion in Post-revolutionary Vietnam. Institute of Southeast Asian Studies: Singapore, 2007, p. 251. ^ Gettleman, pp. 275–76, 366. ^ "South Viet Nam: The Religious Crisis". Time. 1963-06-14. ^ Tucker, pp. 49, 291, 293. ^ a b "Pure Land Buddhism recognised by Gov’t." Viet Nam News. December 27, 2007. Accessed: April 7, 2009. ^ The Global Religious Landscape 2010. The Pew Forum. ^ Cuong Tu Nguyen & A. W. Barber 1998, p. 131. ^ a b Alexander Soucy 2007. ^ a b Cuong Tu Nguyen & A. W. Barber 1998, pg 135. ^ Cuong Tu Nguyen & A. W. Barber 1998, pg 134. ^ Cuong Tu Nguyen & A. W. Barber 1998, pg 134 . ^ Cuong Tu Nguyen 1997, p. 94. ^ Alexander Soucy 2007; Cuong Tu Nguyen & A. W. Barber 1998. Nguyen, Cuong Tu & A. W. Barber. "Vietnamese Buddhism in North America: Tradition and Acculturation". in Charles S. Prebish and Kenneth K. Tanaka (eds) The Faces of Buddhism in America. Berkeley: University of California Press, 1998. Nguyen, Cuong Tu. Zen in Medieval Vietnam: A Study of the Thiền Uyển Tập Anh. Honolulu: University of Hawaii Press, 1997. This page was last edited on 11 April 2019, at 11:43 (UTC).